This guide is designed principally for instructors. It is also useful for those interested in a serious study of history. It presents history as a mode of thinking rather than a list of disconnected dates and names and places. 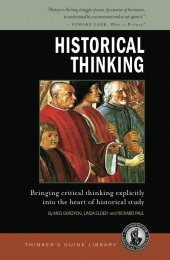 We recommend that it be used in conjunction with the Student Guide to Historical Thinking. Both guides are based on the idea that history, like all subjects, must be understood in terms of the reasoning that is embedded in it. In other words, these guides begin with the premise that all historians ask historical questions, formulate historical purposes, begin with historical assumptions, develop historical concepts and theories, reason from historical perspectives, and think through historical implications. This guide begins with a focus on some important theoretical understandings in history. The foundations of critical thinking are then introduced and linked with a conception of fairminded historical thinking. In the final section, we offer instructional strategies for fostering fairminded historical thinking.